After a day full of threatening weather and watches, a devestating tornado ripped thru Tuscaloosa, Jefferson and St. Clair Counties in central Alabama. In western Jefferson County the ground track of the storm was 1/4 to 3/4 miles wide and stretched from near the Warrior River thru the communities of Oak Grove, Edgewater and Sylvan Springs. leaving a path of destruction 19 to 20 miles long in it's wake. It lifted over the Birmingham areas of Bayview, Forestdale, and North Birmingham, passed over the Birmingham airport and touched down again near Moody in Southwest St. Clair County. Intital reports include hundreds and hundreds of destroyed homes, 16 deaths in western Jefferson County and 2 in St. Clair County. The Storm warning systems of the National Weather Service, along with the local television and radio stations are credited with saving thousands of lives. Tornado warnings had been issued at approximately 7:40 PM CDT and allowed people in the path of this deadly tornado to take shelter. The tornado that ripped thru western Jefferson County has been preliminarily classified as an "F4" tornado by the ABC 33/40 Weather team - meaning winds in the range of 206 to 260 MPH. NATIONAL WEATHER SERVICE METEOROLOGIST HAVE DETERMINED THAT THE TORNADO THAT RIPPED ACROSS WEST JEFFERSON COUNTY LAST NIGHT WAS AN F5 TORNADO, THE MOST VIOLENT TORNADO THAT OCCURS. F5 TORNADOES HAVE WINDS IN EXCESS OF 260 MILES PER HOUR. THE TORNADO TRACK WAS JUST OVER 20 MILES IN LENGTH AND AT IT'S WIDEST POINT WAS ONE-HALF A MILE WIDE. THE TOUCH DOWN WAS JUST SOUTH OF THE TOWN OF SCRAP, IT TRAVELED EAST NORTHEAST IMPACTING OAK GROVE, CONCORD, PLEASANT GROVE, EDGEWATER, MCDONALD'S CHAPEL, AND ENDED IN PRATT CITY. THE STORM REACHED IT'S STRONGEST POINT NEAR THE EDGEWATER/ MCDONALD'S CHAPEL AREA. HAD THIS TORNADO STAYED ON THE GROUND FOR AN ADDITIONAL TWO MILES THE HIGH RISES IN DOWNTOWN BIRMINGHAM WOULD HAVE BEEN HIT; FOUR MORE MILES AND THE BIRMINGHAM AIRPORT WOULD HAVE SEE THE DESTRUCTION AS WELL . THE LATEST DEATH TOLL WITH THIS STORM IS 25, WITH MORE THAN 160 INJURIES. MORE THAN 100 HOMES WERE DESTROYED AND OVER THAN 500 HOMES HAVE SIGNIFICANT DAMAGE. A TORNADO WARNING WAS ISSUED FOR JEFFERSON COUNTY AT 7:45 PM, GIVING RESIDENTS FROM 15 TO 30 MINUTES OF LEAD TIME. THE MOST SIGNIFICANT TORNADO TO IMPACT ALABAMA SINCE 1977, TOUCHED DOWN IN WESTERN JEFFERSON COUNTY AT APPROXIMATELY 7:53 PM CDT. THE TORNADO WAS PRODUCED BY AN INTENSE THUNDERSTORM REFERRED TO BY METEOROLOGISTS AS A SUPERCELL, A LONG-LIVED THUNDERSTORM THAT FREQUENTLY PRODUCES MULTIPLE TORNADOES. 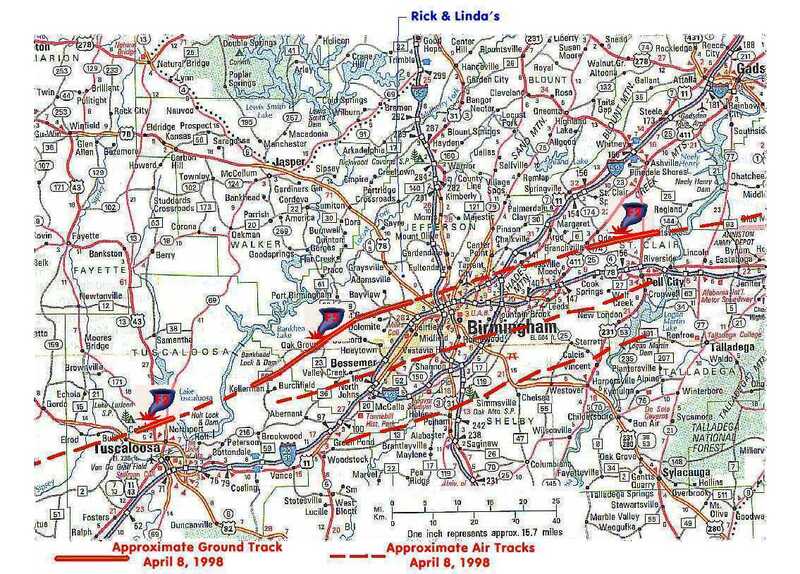 IN AN AERIAL SURVEY CONDUCTED BY NATIONAL WEATHER SERVICE METEOROLOGIST WITH THE HELP OF THE ALABAMA STATE TROOPERS AVIATION UNIT HAVE DETERMINED THAT THE TORNADO THAT RIPPED ACROSS WEST JEFFERSON COUNTY LAST NIGHT WAS AN F5 TORNADO, THE MOST VIOLENT TORNADO THAT OCCURS. F5 TORNADOES HAVE WINDS IN EXCESS OF 260 MILES PER HOUR. THE F5 TORNADO IS HIGHEST RATING FOR THE MOST VIOLENT TORNADO. THE FUJITA SCALE RUNS FROM F0 FOR THE WEAKEST TO F5 FOR THE MOST INTENSE. THE TORNADO TRACK WAS APPROXIMATELY 21 MILES LONG AND AT IT'S WIDEST POINT WAS ONE-HALF A MILE WIDE. THE TOUCH DOWN WAS JUST SOUTH OF THE TOWN OF SCRAP, JUST INSIDE JEFFERSON COUNTY. IT TRAVELED EAST- NORTHEAST IMPACTING OAK GROVE, CONCORD, PLEASANT GROVE, EDGEWATER, MCDONALD'S CHAPEL, AND ENDED IN PRATT CITY. THE STORM REACHED IT'S STRONGEST POINT NEAR THE EDGEWATER/MCDONALD'S CHAPEL AREA. INTERESTINGLY, THE TORNADO WAS ON A TRAJECTORY THAT IF IT HAD STAYED ON THE GROUND FOR AN ADDITIONAL TWO MILES THE HIGH RISES IN DOWNTOWN BIRMINGHAM WOULD HAVE BEEN HIT; FOUR MORE MILES AND THE BIRMINGHAM AIRPORT WOULD HAVE SEEN THE DESTRUCTION AS WELL. THE LATEST DEATH TOLL WITH THIS STORM WAS IN THE UPPER 20S, WITH MORE THAN 160 INJURIES. MORE THAN 100 HOMES WERE DESTROYED AND MORE THAN 500 HOMES WITH SIGNIFICANT DAMAGE. A TORNADO WARNING WAS ISSUED FOR JEFFERSON COUNTY AT 7:45 PM, GIVING RESIDENTS IN THE INITIAL TOUCHDOWN AREA 8 MINUTES WARNING AND PEOPLE TOWARD THE END OF THE 21 MILE TRACK 37 MINUTES LEAD TIME. IN ST. CLAIR COUNTY, THE TORNADO BEGAN JUST NORTH OF MOODY AND CONTINUED ON A EAST-NORTHEAST TRACK FOR APPROXIMATELY 10 MILES. THIS TORNADO WAS RATED AS AN F2 ON THE FUJITA SCALE. THERE WERE TWO TORNADOES IN TUSCALOOSA COUNTY. DUE TO TIME CONSTRAINTS, THOSE HAVE NOT YET BEEN SURVEYED. AN AERIAL SURVEY WILL BE CONDUCTED ON THOSE TWO TORNADOES ON FRIDAY. Although we may not personally know the people - devastated by this tornado - they are collectively our wives and husbands, daughters, sons, and grandparents. Above all they are our friends and neighbors - our hearts and prayers go out to each and every one touched by the fury of this storm. To the families of those who lost their lives to this storm, we deliver our deepest condolence. One of our Birmingham TV stations, ABC 33/40, has live "Pinpoint Doppler Radar" images available in the weather portion of their web site - and a weather staff, which in our opinion, has to rate at the tops in the nation. From a little after 7:00 PM thru to midnight, they were on the air - without a commercial break - bringing full and continuous coverage of the developing storms, their track, and potential path to the viewers in their North Central Alabama coverage area. At one point, there were 13 or 14 Counties under tornado WARNINGS - with 6 or 7 tornados or potential tornadoes being tracked simutaniously!!! The live - neighborhood tracking and warning coverage was fantastic!! The management and staff of ABC 33/40 are to be commended in their commitment to the safety and information service provided to our communities. From 7:55 thru to midnight (with the exception of the period from 8:05 to 8:40 - while we took cover in the south west corner of our basement) we captured these doplar radar images from the ABC 33/40 web site. 3 Image Loop : 7:55, 8:00, 8:05 PM CDT (Animated Images 640X480 - 341Kb) In this loop the classic "hook echo" signature of a tornado can clearly be seen moving thru the Edgewater and Sylvan Springs area west of Birmingham. Perhaps most impressive in this image loop is the 8:00 PM image - in which the hook echo signature can be clearly seen - just to the left and below the "B" in Birmingham - as well as a clearly defined circular pattern of NO PRECIPITATION - the formation of a second tornado that passed over / thru the Shannon and Oxmoor Valley area south of Birmingham !!! 8:40 - 9:50 PM CDT (Animated Images 240 x 180 - 279 Kb) In this loop, the first storm line which contained the killer tornado is seen East of the Birmingham area moving into St. Clair County and dropping for it's second killing pass - while a second line of storms forms for it's sweep thru the area.. If this does prompt you to make a donation, a mention that you were referred by - would be appreciated. .... WEATHER NOTEBOOK: Would you believe there is a bit of good news about an F6 tornado? F6 Inconceivable Tornado: (winds 319-379 mph) These winds are very unlikely. The small area of damage they might produce would probably not be recognizable along with the mess produced by F4 and F5 wind that would surround the F6 winds. Missiles, such as cars and refrigerators would do serious secondary damage that could not be directly identified as F6 damage. If this level is ever achieved, evidence for it might only be found in some manner of ground swirl pattern. Incredible Tornado (winds 261-318 mph) Strong frame houses lifted off foundations and carried considerable distances to disintegrate; automobile-sized missiles fly through the air in excess of 100 meters; trees debarked; steel reinforced concrete structures badly damaged. This page has been visited times since adding a counter, 19:30 10 April 98.